Meet our Herbies of the Week: Cat & Shelton! Even though they came to the idea of going plant-based separately, this brother and sister team have been each other's cheerleader the entire time. When they started their plant-based journey, Shelton weighed nearly 500lbs, but has lost over 130lbs and Cat is down more than 55lbs!!! Amazing! Read on for their inspirational story! I can’t relay my plant-based journey without including my brother, Shelton. We have always been very close. We are 7½ years apart, with a younger sister (who has NEVER had weight issues!) As children, Shelton and I sought comfort in food. Between the two of us, we never met a food we didn’t like! Our weight issues followed us into adulthood, although we each sporadically managed to lose (and regain!) significant amounts of weight. Fast forward to about 2011: Shelton lived and worked with our dad, who has severe arthritis and needs a walker or scooter chair to get around. I lived about an hour away with my husband and young daughter. We came to the idea of plant-based eating separately, but around the same time. 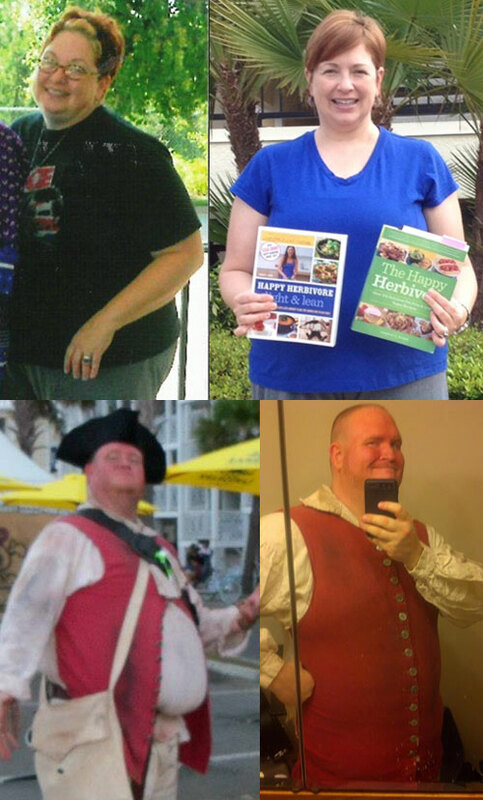 We both watched “Forks Over Knives,” we read “The Engine 2 Diet,” we both read “Eat To Live.” I had already given up eating meat (but made up for it with LOTS of sugar, so – no weight loss, and ever-increasing health problems.) Shelton was struggling with adult-onset diabetes, but began incorporating healthy changes slowly. In 2012, I moved 500 miles away when my husband took a job in Florida. Working from home, without the support of friends or family, my weight hit an all-time high of 249 pounds. Even though I knew all about plant-based living, I wasn’t putting those principles into practice. One day, I made a special trip to the grocery store just to buy a box of Little Debbie cakes for a snack (I could eat an entire box of them in one sitting). I knew it was time to make a serious change. I cracked open my Happy Herbivore Cookbook, found HH online, and got to work. Lindsay’s practical, real-life information helped us move from knowledge to action. In the last year, we have both made a serious commitment to living the plant-based lifestyle. We talk or text almost every day, and we frequently text each other pictures of what we’re eating for lunch or dinner. Are we perfect? NO! Looking through our text messages, I found one from me: “A pretty good day – HH Scramble for breakfast, HH Hippie Loaf for lunch, but then: pizza for dinner. And cinnamon sticks. Tomorrow is another day!” The concept of “progress, not perfection” has really resonated with us. If I get stuck somewhere and cheese pizza is my only option, I now know that I won’t die if I eat it, nor will I be kicked out of the HH group. We do our best and keep trying! Our family has been, for the most part, supportive. They have not offered to get on board with us, though. Shelton lives with my dad, who is NOT plant-based – Shelton plans, shops, and cooks two different sets of meals – I do, too, because my husband and daughter are not (yet!) on the Herbie plan. This is where the pre-prep really comes in handy for me. When I have cooked and frozen something like Hippie Loaf or have the menu plan components assembled or otherwise ready, it takes me 5 minutes to prep and plate my meal, so we can all sit down and eat together. When we began our respective journeys, Shelton weighed in at 495 pounds. To date, he has lost 138 pounds. I weighed 249, and now weigh 192. So – 195 pounds between the two of us! The biggest components of our journey: The meal plans, the cookbooks, the blog posts and support – all of these things set us up for success. We plan, we shop (once I was loading frozen vegetables into my cart with such zeal that a woman ran up to the freezer case and said “Are they on SALE?” My daughter said “Nope! My mom’s a HERBIVORE!”) we cook (and freeze). I cook for a couple of hours one Sunday each month to load the freezer with chili, soup, and HH Hippie Loaf. That way, there is always something on hand. We keep healthy snacks or bowl components on hand so we’re never at a loss for what we can eat. We have been inspired to whip up our own creations and share the recipes with each other. We have learned how to plug in what we know when functioning in the “real world.” Shelton and his friends participate in pirate fests, singing sea shanties and enjoying the festival atmosphere. (Shelton’s before and after pics are in his pirate garb. The vest now buttons all the way up!) Shelton has learned how to make wise choices on these trips, and that it’s okay to let go sometimes and indulge. My daughter takes karate and frequently travels to tournaments. I keep HH-approved snacks in the travel bag for those days when she’s at the tournament all day and the only food choices are “snack bar” choices like hot dogs and potato chips. 1. BE PREPARED – set yourself up for success by keeping healthy foods on hand. Learn to make bowls, salads, wraps, and make them your “go-to” meals when you don’t have time or energy to be in the kitchen. 2. DON’T QUIT! As human beings, we strive for perfection and think our efforts don’t count when we don’t hit all our goals. But every effort to go plant-based counts. It really does get easier! You can eat satisfying, complete meals and get healthy. YOU CAN DO THIS! Thanks so much for sharing your plant-based journey with us Cat & Shelton!